The town of Kancheepuram near Chennai in Tamilnadu is also popularly known across the country as Silk city for the economy of the town is mainly based on the people weaving silk sarees. The weavers from this town are believed to have settled at least 400 years back and they stamped a fortunate opinion across the globe as the producers of excellent silk sarees in the country. Thus the major economy of Kancheepuram is from the handloom industries and tourism because the city is loaded with rich cultural heritage. Kancheepuram located in the south of India has magnificent temples featured by distinct architecture bearing expressive evidence to the acclaimed Dravidian heritage. This old town is also known as the temple city and the city of thousand temples. Kanchipuram was ruled by different Kings like during the period of 6th to 7th century AD the Pallava Kings ruled and followed by the Cholas, Vijayanagar Kings, the Muslim and the British. History says that it was during the period of Krishna-Deva Raya’s reign that Kancheepuram acknowledged superiority. Saree MAJOR WEAVING COMMUNITIES – THE DEVANGAS AND THE SALIGARS -It was during this period that the two major weaving communities the Devangas and the Saligars of Andhara Pradesh migrated to this dusty town. Primarily because within this seemingly minuscule town there were more than 129 finely crafted temples. Those days it was more of customary and traditional practice to wear silk clothes during ceremonial occasions like weddings and rituals. No wedding is said to be complete in India without the wearing of Kancheepuram silk clothes. The weavers from the Devanga and Saligar community were known for their weaving skills. The main profession of the people of Kancheepuram is weaving silk sarees. SareeSILK SAREES HAVE BECOME AN INTEGRAL PART OF OCCASIONS – The silks sarees have become an integral part of occasions like weddings and celebrations for apart from the luxury it talks it is also known for the rich weave and the gold borders. Whatever the pattern may be, whether the simple self border or the colourful contrast border with gold zari, dots and motifs the saris are noted for their genuine and dignified look with unique and vibrant color combinations.The Kancheepuram silk saris are supposed to be the best among all the silks in the world. Kancheepuram, the silk capital is said to have more than 20,000 looms where 3-4 weavers work in each loom and nearly 4-5 lakhs of silk saris are produced every year and shipped to different parts of the world. SareeSPECIALTY -The kancheepuram saris are popularly known as the queen of all saris as it has a noted texture, glimmer, permanence and refinement. 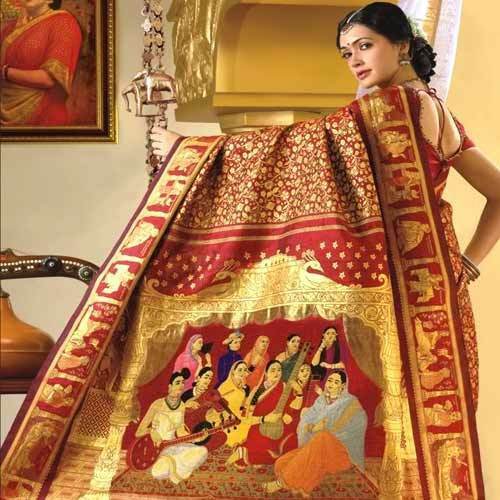 They are the most elegant, desirable and luxurious of all sarees. These saris are made from a heavy silk material known as the Kancheepuram silk which can be very easily maintained at home. It can be washed with water at home for the saris are durable enough. It is quite expensive for the fact of its finesse and it weighs more than any other silk sari. The quality of the sari is graded based on how heavy the sari is. The heavier the sari the better the quality. But however these days there are also light weight saris available in the market which are made from Korean and Chinese silk. The mulberry silk which is got from Karnataka and Tami Nadu are supposed to be the best silk for weaving the classic Kancheepuram sari. SareeSILK THREAD FOR THE SAREE -The silk thread before it gets into the sari is dipped in rice water and sun dried. The Kancheepuram saris are hand woven and the silk yarn is dyed with interleaved designs made with ‘Zari’. This is done by twisting a silk thread with a thin silver wire and then moved smoothly with pure gold. 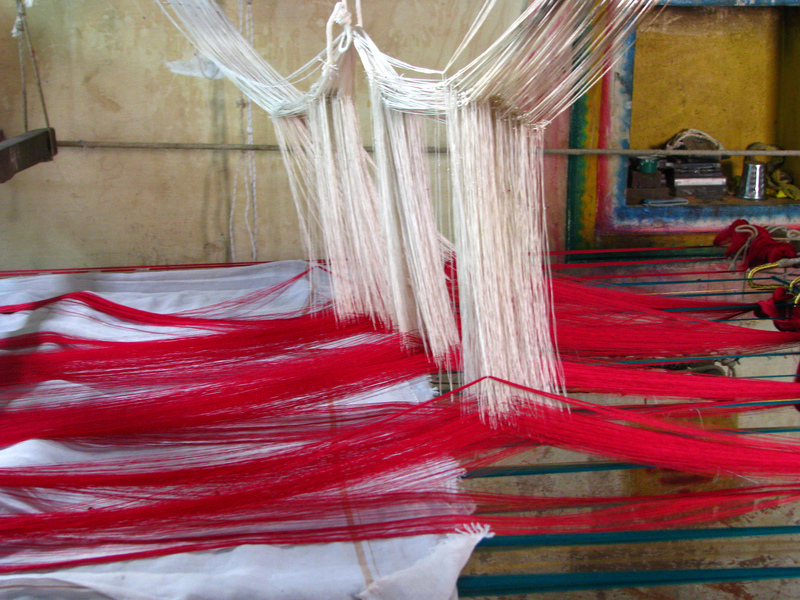 The thread which is used in the weaving process is in turn made of three single threads twisted together which makes the sari comparatively stronger and expensive than the other varieties like Arni, Dharmavaram, etc.The specialty of Kancheepuram sari is that in 1.2 inches of warp frame there will be 60 holes in which there will be 240 threads in Warp and around 250 to 300 threads in the Wept which gives strength to the sari. Apart from this, the designs on the sari also adds up to the fame. Selecting a Kancheepuram sari is quite challenging for apart from the vibrant colours it is available in different eye catching designs and varieties. SareeKANCHEEPURAM FLOURISHES WITH SILK INDUSTRY -Kancheepuram flourishes with silk industry with handloom artisans and merchants. The main item required in the making of the Kancheepuram saris are the mulberry silk thread and metallic thread (Zari) and dye. Karnataka and Tamil Nadu are the places from where the mulberry silk thread is got whereas the metallic thread comes from Gujarat and this is used to interweave with the silk thread and thereby gives the metallic look. All the raw material sourced is then in the hands of the skilled artisans. Some of the common motifs which are weaved in the Kancheepuram saris are Sun, moon, chariots, peacocks, parrots, swans, lions, coins, mangoes, leaves, a jasmine bud within a square or a round frame, locally known as mallinaggu and thandavalam with parallel lines running across the body of the sari.The saris also display the structures of temples – the Ekambaranathar and Avudaliyari saris bear the designs of these shrines. Apart from its own specialties when it is worn on ceremonial occasions the sari in turn brightens up the whole place. SareeWEAVING TECHNIQUES OF THE KANCHEEPURAM SAREE -There are legends which state that the weavers in Kancheepuram are the descendents of the sage Markanda, the Master Weaver of Gods and also it is believed that silk fabric is the most favourite of Lord Vishnu and hence there are a number of looms around the Lord Vishnu temple. Kancheepuram holds a good place in the history of handloom weaving dating back to the Sangam period. The weaving traditions followed here is quite unique. The whole process is quite intricate and also consumes lot of time to weave a single sari. The main technique which is followed in the weaving is known as Korvai where the borders are interlaced with the body of the sari. The contrasting colors of the borders in the weaving of the weft are interlinked with the body of the weft with each throw of the shuttle. It generally requires two people or weavers where one has to concentrate on the working of the threads and the other weaver has to work on the border colours. SareeBORDER ON BOTH THE SIDES OF THE SAREE -When border is required on both the sides of the sari it takes at least three shuttles for each sari. The best and the most elaborate part of the sari will be the pallu which is interlinked to the main body of the sari by a special interlinking weave known as ‘pitni.’ In the hands of the skilled artisans the sari gives the look of a continuous weave where the interlinked portion is never visible or camouflaged beautifully. The zari which is used in weaving constitutes about 57% of silver and 0.6% of gold and also the colour of the dye used in the borders and the pallu is different from those used in the other common sari. It takes at least 10 to 15 days to weave a single sari and for the duration is mainly based on the uniqueness and the intricacy of the designs. There are more than 5000 families who are totally involved in weaving industry for generations and their life is totally based on this. SareeLATEST TRENDS IN KANCHEEPURAM SAREE -Some of the latest trends in the Kancheepuram saris is Aishwarya Kanchipuram Saree, Anuradha Kanchipuram Saree, Ankusha Kanchipuram Saree, Aradhana Kanchipuram Saree, Tammana Silk Saree, Chandralekha Embroidery Saree, Anusha Kanchipuram Saree, Apeksha Kanchipuram Saree, Amitha Kanchipuram Saree and Chinmai Kanchipuram Saree. All these latest arrivals can be purchased from some of the renowned shops available in the state like Pothys, RmKV, The Chennai Silks, Shri Kumaran Silks and Nalli silks.Nalli and Kumaran Silks trade from independent weavers and make the saris available in their particular stores in foreign countries. The use of computers in creating designs is on the rise. But however a direct purchase from Kancheepuram itself will be comparatively low or fairly priced. The genuine or the original Kancheepuram saris are tagged quite high for it involves lot of labour and intricate work. Also the materials used in the making of the Kancheepuram saris are mainly zari and gold thread. SareeKANCHEEPURAM SAREES ARE EXPORTED TO DIFFERENT COUNTRIES – It costs anywhere between 2,500 to 1,00,000 in INR and in dollars US$38 to US$1,500. But it is a life time investment and very much worth. The Kancheepuram saris are exported to different countries like US, Sri Lanka, Italy and Russia since 1960. Noted for its shimmer and beauty people come all the way from a long distance only to purchase the Kancheepuram saris for family functions and weddings. The Kancheepuram silk saris take the credit of being one among the 18 Geographical Indication (GI) tagged products of the Tamilnadu government. The GI label not only certifies the origin but also establish its condition to the standards. The GI label of Kancheepuram saris aids in selling original silk saris in the global market. The Kanchipuram silk industry operates mainly through co-operative societies and private traders. Now it is estimated that there are at least 6000 looms in the city where the turnover exceeds Rs. 200 crores with exports of approximately Rs. 3 crores. SareeRESEARCH BY THE EXPERTS REGARDING EXPORT -But however research by the experts says that the export is not grown to maximum for the demand outside India is not appreciable. So the government is looking upon product diversification. Also the tastes of the people keep changing where now they prefer more of light weight saris. So lot of changes has been made according to the latest trend where silk and cotton are blended to get the body of the sari and thereby the gold and silver content in the zari is reduced and ultimately the cost of the sari. These procedures have adversely affected the reputation of the Kanchipuram silk sarees and are affecting their sales in a negative manner. SareeGOVERNMENT OF TAMILNADU HAS SET UP A TECHNOLOGY INFORMATION COUNCIL -The Government of Tamil Nadu has set up a Technology Information Forecasting and Assessment Council for testing the zari which is used both by the co-operatives societies for silk saris and individuals by paying a nominal fee. The co-operative societies are facing lot of problems like piling up of stocks and decline in working capital. So not knowing what to do they come up with discounts on sari prices. The government also offers a rebate on these saris. In spite of lot of ups and downs of the weavers the Kanchipuram silk industry has managed to survive and is struggling hard to make its presence internationally. However, the biggest challenges faced by it today are undertaking modifications to suit changing customer preferences, use of modern technology and product diversification. Original silk sarees can be identified by its authenticity and the symbol attested by The Silk mark Organization. Sarees that have a hologram indicating that the sari is of pure silk.